Multitasking is the antithesis of the concept of “flow” or “being in the zone,” as identified by Mihaly Csikszentmihalyi. We want flow. It’s an essential part of creativity. Can you be creative when you’re unfocused and distracted? Sure. But the output probably won’t be as great — or feel as good — as what you get when you experience flow. I’m in the middle of a client project and reflexively check my e-mail. A new action item comes in — something that will only take a couple of minutes to take care of. So I do that quick thing, and in the process remember that I’ve forgotten to order more paper towels. So I go to amazon to order paper towels and realize that I need to order a few other things too. I try to remember what those things are while going to the kitchen to make a fresh cup of tea. I unload the dishwasher while waiting for the kettle to boil. Back at my desk, finishing the amazon order, I get a text from one of my sons asking for a ride home from the train station later. I look at my schedule and realize that I have to make an ATM deposit, which I can do on the way to the train station. I take a few minutes to put together my deposit, which requires me to open my bookkeeping application and make a few entries. I glance at my to-do list and realize that I’m overdue for posting an update to a client’s facebook account. I go to facebook to make the update, but inevitably see my personal notifications at the same time. I get sucked into the feed. I click through to external pages. When a page is slow to load, I open another browser window and read news headlines or take a turn in Words With Friends. I realize it’s getting late and I really need to finish the client project I started with. I work on that for a a short burst before reflexively checking my e-mail again and the whole cycle repeats in some variation. A pathetic spin on If You Give a Mouse a Cookie. Can you relate? At the end of the day, I’d have the unpleasant feeling of having been busy for hours without having made much measurable progress — and without having done anything to the best of my ability. That doesn’t work well, and doesn’t feel good. How had I gone so awry? 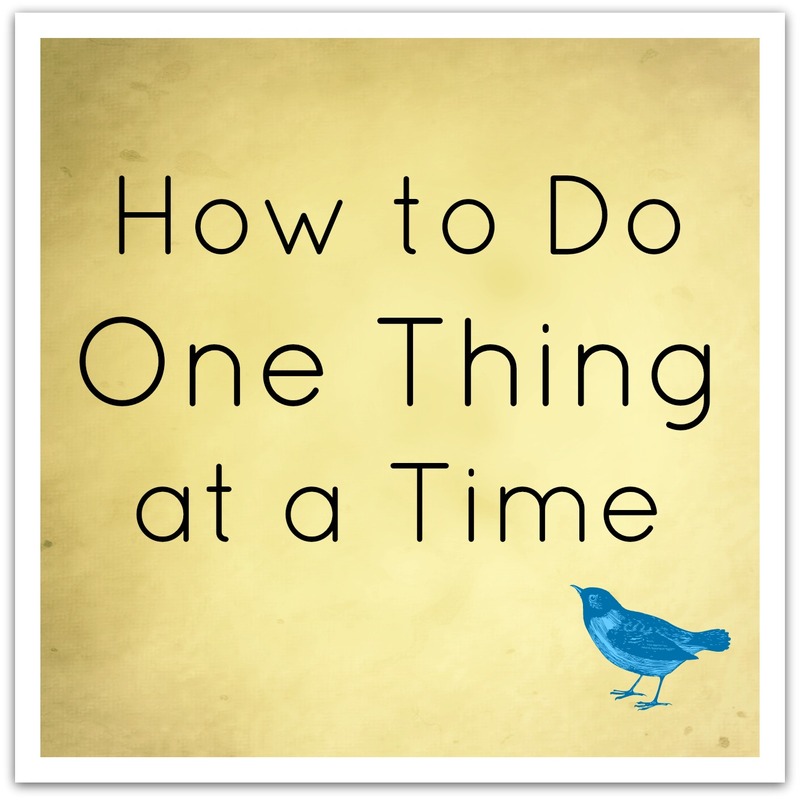 How could doing just one thing at a time possibly be so complicated? I knew it had something to do with electronic life — and the real-time availability and demands that come with it. I realized that I needed some training wheels. More than training wheels, I needed some duct tape and a hammer. I had to start doing one thing at a time, doing each task until a) it was completed or b) for external or predetermined reasons I had to stop. Duh. But for some reason, I couldn’t get myself to stick to this simple framework. Enter the time log, which has — literally — transformed my life. We know that dieters who write down everything they eat lose more weight than those who don’t. There’s something about having to fess up — even if just to yourself — that encourages you to stick with your intentions. Here’s what I started doing. In the “notes” side of my two-page per day planner (although you could use anything — including a sheet of paper) I write down the time and what task I’m starting. When the moment comes that I need/want to do something else, I write down the time and what I’m about to do. I can do anything I want, but I can only do the one thing I last wrote down. If I’m going to change tasks, I have to write it down first. You get the idea. The thing is, if I hadn’t been keeping this log, I wouldn’t have stuck with that 90-minute focused work block at 10:00, and I wouldn’t have refrained from checking e-mail during my playtime with Liam. Keeping this log continually reminds me of my commitment to doing just one thing at a time, and to doing it as well as I can. For larger projects, I decide ahead of time that I’m going to spend 60 or 90 minutes on that project. Then, if necessary, I stop and move on to the other things that have to get taken care of. Do yourself a big favor and close your e-mail client and all social media when you’re not actually “doing” those things. Sticking to your time log is easier without those added temptations. It also helps to spend some time in the morning outlining what you need and want to get done that day, so that as you finish one thing, you don’t get lost trying to decide on the next. Assign time estimates to each task on your list beforehand. And if you like to take a lot of breaks, by all means, take them! Just write down what you’re doing. Then you don’t run the risk of kidding yourself when your 20-minute break turns into a 2-hour social media binge. The only downside to the log is that now I feel lost without it. I’ve started using it from the moment I get up in the morning. It helps me avoid OD’ing on Words With Friends when I really want to be doing my Morning Pages. If you’re motivated to try this, or have another plan for reducing your busy-ness, please share it below! i still keep my handwritten calendar for similar purpose. granted, some days the pages are blank while the day is still full, but i try. 🙂 it helps me keep events in better order and to a minimum than electronics, though. Can I relate? Hell, yeah! I can relate all too well (as I suspect most people who read your post can). The idea of keeping a time journal just as you would a food journal is a great one, though! I shoud try it for a few days, because heaven knows I have my own issues when it comes to multitasking and becoming distracted in the process. Let us know how it goes, Andy — I’ve been getting feedback from people that the log is as illuminating for them as it is for me…. I’m going to share your post on our FB page…. I have been struggling with this myself trying to market and grow 3 businesses and take care of 3 kids. Love it. thanks! Thank you for sharing, Tawny! Too funny, Debby — great to have you here! I needed to re-read this post from the archives today — and I’m glad I did. Maybe you’ll benefit from a quick perusal too!